Come one come all! It's time again for the annual Tri-Area Scouting Hobby Show and Venturer Digital Competition. Open to all Scouting sections and groups in The Alders, Humber West, and Old Mill. 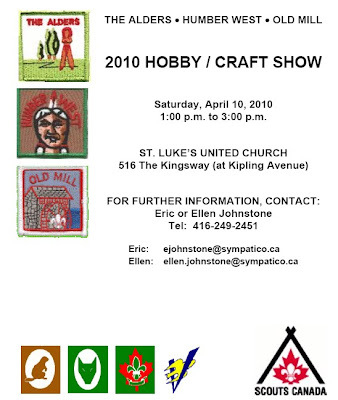 Time: Saturday, April 10, 2010 from 1:00 p.m. to 3:00 p.m. There are 28 classes of entry with multiple sub-classes. Literally hundreds of awards and honourable mention ribbons will be awarded.